Talkdesk held its first industry analyst conference in San Francisco as part of its customer and partner event, Opentalk. A group of analysts got to spend time with CEO and founder Tiago Paiva and his executive team to learn about where the company is headed and why it’s gaining so much momentum. In addition to the analyst sessions, we also got to attend Opentalk keynotes and breakouts. Talkdesk is Enterprise Ready. I can sum up what I heard very succinctly: “We’re big, we’re global, we’re growing fast.” While 90% of Talkdesk’s revenue initially came from SMB customers, today more than 80% of its revenues are from enterprise customers. With 1,400 customers in 60 countries, the company is growing quickly and expanding globally. To meet enterprise needs, Talkdesk has focused on enhancing security, and now has more than 20 certifications, including HIPAA, PCI, NIST, NHS, etc. This is expected to more than double in the next 12 months. Paiva notes that scale is a key part of serving enterprises, highlighting the company’s nine global data centers. The company is also expanding globally throughout North America and EMEA, with the initial focus on the U.K. For example, London-based Farfetch, which provides an online fashion retail platform, deployed more than 1,000 Talkdesk seats to 12 offices and countries. I had a chance to speak with Paiva about how Talkdesk is enterprise-ready, the AppConnect program, the new Talkdesk Innovation Fund and how Talkdesk differentiates from competitors. There were tons of announcements at the event, including several new products that will be part of the upcoming Winter Release. The first product is Talkdesk iQ, described as a combination of new products and features in the Enterprise Contact Center Platform. Talkdesk iQ will work with every other element of the platform, including ACD, IVR, reporting, analytics, etc. I spoke with Adibi about Talkdesk iQ and learned why he compares AI to guacamole. As Charanya “CK” Kannan, VP Head of Product, noted, 60% of customers interact through multiple channels and should be able to communicate in any channel with a seamless experience across channels. Talkdesk Omnichannel will let customers engage with agents on any channel, including voice, messaging, email, mobile apps, chatbot, social media, live chat, etc. Messaging apps include Facebook Messenger, Twitter, WhatsApp and many others. Talkdesk recognizes the importance of messaging and has done a nice job of adding a large number of communication channels as part of its omnichannel offering. Talkdesk Omnichannel fills a gap in the company’s offering and should be very welcome by most customers. Talkdesk’s philosophy had been to provide deep integration to its AppConnect CRM partners such as Zendesk and Salesforce, which provide all of the digital interaction channels (e.g., non-voice channels). While this is fine for some customers, others prefer to have an omnichannel solution from Talkdesk, providing consolidated reporting and a more seamless approach. One interesting aspect of Talkdesk Omnichannel is social listening, which can identify and route social media and survey posts as inbound interactions to agents. For example, if a customer posts an unfavorable review about a company on Yelp, the review can be routed to an agent who can respond appropriately. This can have a lot of value if used properly and can potentially help businesses retain unhappy customers. The Omnichannel offering also includes Chatbot builder, powered by Talkdesk iQ, to instantly build a bot for automating routine customer interactions. It features more enhanced reporting across all channels, which is something that customers had been asking for. The new mobile application lets agents engage with customers anytime, anywhere, using a native app built on iOS and Android. Agents can access the Talkdesk Callbar interface from their mobile device for inbound and outbound call handling and other browser-based functionality. The mobile app works with any CRM and provides agents with a complete view of the customer. With Talkdesk iQ, AI can be used to identify the user’s tone and mood and can help automate agent after-call work. The SDKs will let customers build self-service solutions “with clicks, not code,” creating customer self-service applications in hours, not months. Customers can build Visual IVR, connect to any existing knowledge base, offer callback with estimated wait time, and more, while providing real-time context when agents speak with customers. Studio is used to “orchestrate customer experiences” by designing IVR, channel and automation workflows. It provides more than 20 out-of-the-box integrations, eliminating or reducing the need for professional services. Talkdesk is turning data into decisions by releasing a newer version of its reporting and analytics suite. The suite includes the Talkdesk Live API-based customizable dashboard; Talkdesk Benchmark to compare and benchmark performance to industry peers; and Talkdesk Explore, a historical reporting and business analytics tool. I spoke with CK to discuss these new announcements. The most popular announcement during Paiva’s keynote was the new 100% Uptime Service Level Agreement (SLA). Based on the audience reaction and according to the customers I spoke with, this was a huge hit. Calling it an industry first (although that’s up for debate), Talkdesk will provide a 100% Uptime SLA to every Enterprise customer and will issue a credit or compensate the customer if they’re unable to make or take calls. While acknowledging that the devil is in the details, Paiva noted that this announcement demonstrates Talkdesk’s confidence in the platform’s resiliency, consistency and reliability. 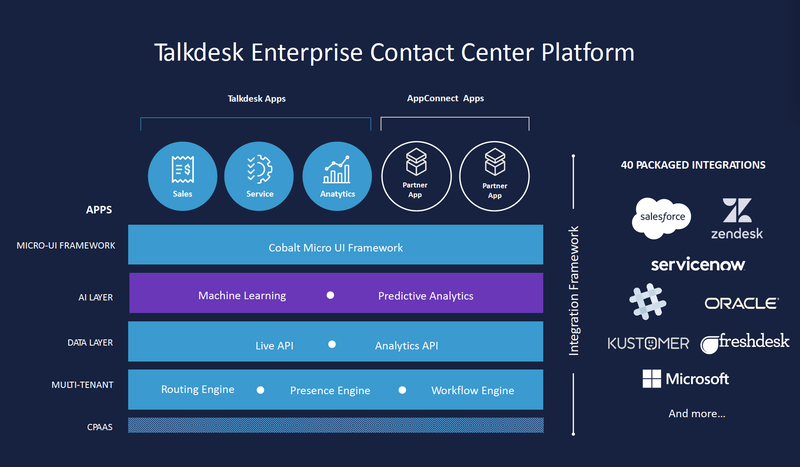 Paiva explained that the Enterprise Contact Center Platform (shown below) is 100% microservices-based and built for the modern age, and that Talkdesk is “executing in a truly modern SaaS architecture,” which will provide the quality needed by customers. It will be interesting to see how the 100% Uptime SLA guarantee will work, how many customers will try to game the system and how Talkdesk responds to any issues. Client Services is a big part of Talkdesk’s offering; they strive to help customers succeed and meet their customer experience goals. To support their customers’ needs throughout the customer journey, Talkdesk provides unrestricted direct access to Customer Service Managers (CSMs), as well as unlimited use of customer/technical support, and local 24/7 support, regardless of location. This has resulted in 98% CSAT and 99% retention. I spoke with Gillian Heltai, Senior Vice President of Client Services about Talkdesk’s customer success model, and why it’s been so successful. Zumiez deployed Talkdesk in January 2015, supporting 18-20 agents, and up to 50 agents during the holidays. The Talkdesk Live Dashboard – Zumiez agents often handle both digital and voice interactions at the same time and need to know when more time-sensitive interactions such as voice or chats need attention. The Live Dashboard lets agents see their calls, email and SMS, and determine where they’re most needed. To sum up the Opentalk event, I spoke with Folia Grace, Vice President of Marketing. In this video interview, Grace discusses Opentalk, as well as Talkdesk’s focus on innovation. She also describes the 100% Uptime SLA and how it will work in greater detail. As Grace mentioned, Opentalk pulled together a range of speakers from various industries, providing insights to improve the customer experience. With keynotes, new product announcements, live demos, videos, customer testimonials and more, it was a lot to pull off. A great big shout-out to Janice Rapp, Head of Product Marketing, for juggling so many balls to make it all come together. Similar to how iQ was described, Janice was behind the scenes, so all we saw were the results. Talkdesk did a great job of listening to its customers and filling in the gaps in its offering by providing the capabilities that customers were asking for (notably omnichannel and analytics). Talkdesk is likely to have some growing pains as it expands to larger deployments and to more global regions. Global expansion is always tricky, and Talkdesk is being cautious and not trying to cover too many countries and regions at once. As the company grows and focuses on larger customers, it will need to make sure that it doesn’t lose its focus and can maintain its growth without sacrificing customer success.